Keep Christ in Christmas. It’s a slogan you may hear quite often this time of year. While we may see this message on car stickers and posted all over the internet from Facebook to Twitter and more, we may not know of the many ways you can experience the reason for the season. 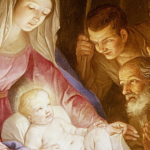 We welcome you with humility to remember the birth story of when God came to earth in the person of Jesus. If you are looking for ways to live out the true spirit of the season and therefore would like to keep Christ at the center of your Christmas, we’ve prepared a list of actions we can take to live out God’s intentions. Below you can read of ways you can “Keep Christ in Christmas” while enjoying the other festivities that make this time of year so special. Set up a Nativity and make it a focus in your home. Participate in Advent. Light an Advent wreath or candle each day leading up to Christmas. Don’t stress about things that really don’t matter this season. Do something for someone else on Christmas Day. Watch ‘The Nativity Story’ together as a family. This PG movie tells very well the greatest story ever told. Cherish traditions with your family. Start some new ones! Attend church on Christmas Eve and try to make attendance a New Year’s Resolution. Donate a gift for a family in need. Forgive someone. Jesus came to forgive our sins. In this way, we too are asked to forgive. Especially in this year of mercy, prayerfully consider who and how to forgive. Whether you must ask someone for forgiveness, or experience a private moment between you and God, try to wipe the slate clean with someone this holiday. We wish you a Merry Christmas from all of us at The Leo House. It is with great excitement and hope that one day soon we may welcome you into our home in New York City. What are some special ideas of actions you take to “Keep Christ in Christmas”? Please share with us below. We’d love to add them to our list!